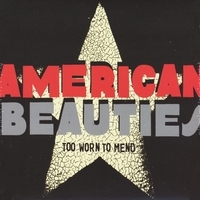 American Beauties: "Too Worn To Mend"
Too Worn To Mend deliberately steps to you with the mid-tempo'd "Snow Blind," bringing with it Jayhawks-like vocal harmonies and full-bodied production qualities. The album was mixed and recorded by Grammy Award winner Ducky Carlisle (Buddy Guy, Living Proof) and the honest sound shines through via crisp vocals, broad drums, and delicate guitars. Mastering duties were dealt to Roger Siebel (Decemberists, Death Cab for Cutie), who gave the album a warm, friendly, and familiar feeling. Hearing this album reminds me of when Andy Van Dyke handed me his self-titled Rainravens album in Austin, Texas a couple decades ago. Both records surprised me, embodying a mature and well-crafted musical quality without a hint of flash or pretentiousness. Just down-to-earth songwriting brought to life through solid musical performances. - from "Tell Me That You Love Me"
American Beauties sing CSNY-inspired vocals and come to play, with a great deal of seriousness and respect for their craft. It's no surprise, then, that Too Worn To Mend is a quality album that masterfully blends its thoughtful singer/songwriter composition with an Americana-styled sensibility.